When a business is preparing financial projections for a business plan, and has established a target gross profit level, it is useful to be able to flex the financial projections to understand how a change in product selling price can be compensated for by a change in unit sales volume in order to maintain the same gross profit level. The purpose of this pricing for profit calculator is to show the percentage increase in unit sales volume needed for a business to maintain its current gross profit level in the event that it changes its product selling price. This topic is more fully discussed in our tutorial on pricing for profit in financial projections. Enter the change in selling price percentage. For example, if it is planned to raise prices by 5%, then enter 5%. Likewise, if it is proposed to lower prices by 10%, then use a minus sign and enter -10%. The pricing for profit calculator works out the percentage by which the unit sales volume needs to change in order to compensate for the change in selling price and maintain the same gross profit level. If you want to see an example, the second part of the spreadsheet headed Gross Profit, allows you to enter details relating to the current selling price and unit sales volume, and demonstrates that the gross profit is the same both before and after the selling price changes. By entering the current product selling price, the pricing for profit calculator calculates the cost, gross margin, and gross margin percentage for the product both before and after the selling price change. By entering the current unit sales volume, the pricing for profit calculator will also calculate the revised sales volume needed, and calculate the total gross profit to demonstrate that the profit is the same both before and after the selling price change. The pricing for profit calculator is available for download in Excel format by following the link below. Users use this pricing for profit calculator at their own risk. We make no warranty or representation as to its accuracy and we are covered by the terms of our legal disclaimer, which you are deemed to have read. 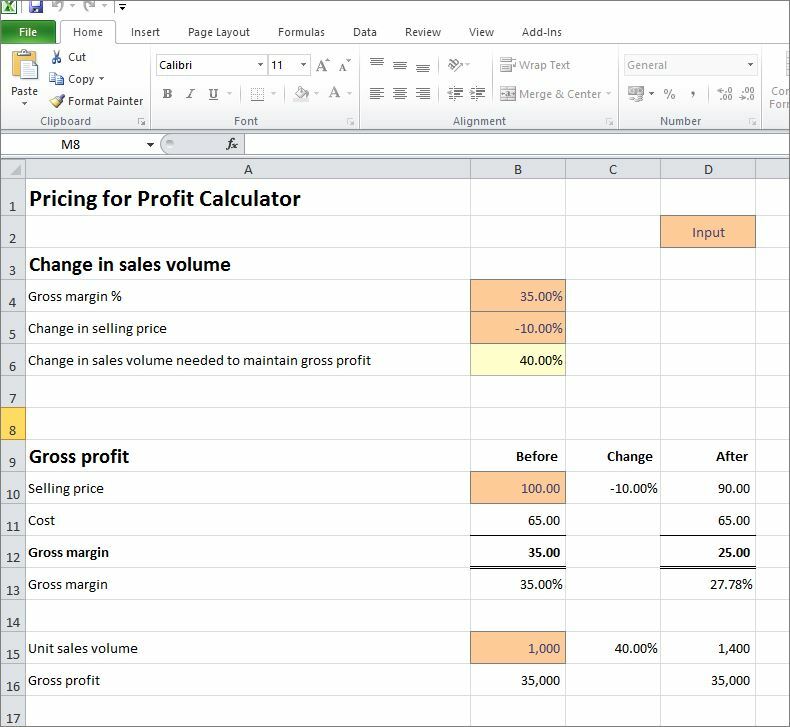 This is an example of a pricing for profit calculator template that you might use when preparing financial projections in Excel. It is purely illustrative of a small business accounting calculator. This is not intended to reflect general standards or targets for any particular company or sector. If you do spot a mistake in the financial calculator, please let us know and we will try to fix it.